Signed l.r. corner within weave, blue wool "Coburn". Not dated. 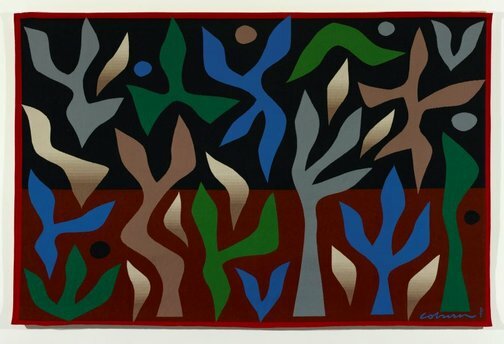 John Coburn's "The Seasons" tapestries , 1988, 7, 12, 43 (colour illus.). Elwyn Lynn, The Weekend Australian , 'Flamboyance unravelled', pg. 10, Sydney, 06 Jan 1990-07 Jan 1990, 10. Review of 'The Seasons' exhibition at the Art Gallery of New South Wales. Amanda Uhlmann, The Canberra times , 'The culmination of a philosophy', pg. 12, Ainslie, 20 Sep 1990, 12. Review of 'The Seasons' exhibition at the Nolan Galleries. Sue-Anne Wallace, The Canberra times , 'Spiritual, physical threads interwoven in Seasons', pg. 7, Ainslie, 29 Sep 1990, 7. Review of 'The Seasons' exhibition at the Nolan Galleries.